The oldest profession is still alive and kicking! 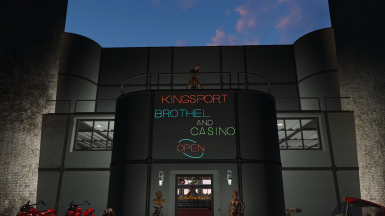 Welcome to Kingsport Brothel and Casino! So "lore friendly" Bethesda is remaking the entire game just to include it. Ever wonder where Overseer Barstow went? Well... Wonder no more! Trusted sources tell me, she discovered that there was only 1 operational vault left in the Commonwealth, Vault 81. So without hesitation she hot footed it right over there. But alas, her timing was a bit off and she arrived just after the Hole In The Wall mess. Try as she might to share her wonderful schematics, it didn't end well, and they booted her right out the door. Not being one to accept defeat, she quickly set in motion "Plan BC69". With this plan, she would shadow the Sole Survivor as he/she diligently cleared and setup settlement after settlement after (I hate Preston) settlement. 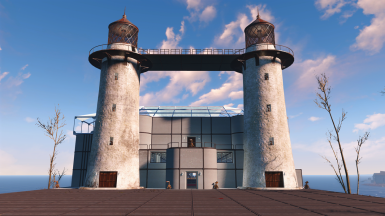 Once the perfect location was cleared, she would strike a deal with the Sole Survivor to build her a Brothel and Casino and allow her to become the Overseer/Madam. In return, the Sole Survivor would be rolling in caps, chems, booze and all the Lovin they could handle! The Kingsport Brothel and Casino includes the following amenities. 6 privet rooms. 3 "What? That was IT!" rooms and 3 "All Night Looong" rooms, complete with functional bath. The top floor is the VIP Penthouse. Accessible through the Security/Overseers office. I did not finish this area in order to keep this blueprint "Nexus Safe". I will have a full blown Adult version, just not here. lol! 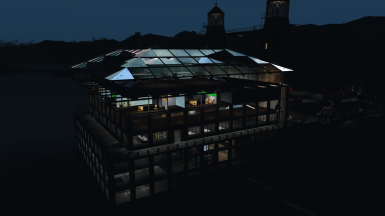 In the basement we have Hydroponics, Reactor Core, water purification plants, workers beds and a few jail cells for those who can't behave. You'll also notice stairs going down to the water. They're there because... well.. Bethesda. All of the booze, chems, meds, food and clutter scattered all over the place (hide & seek anyone? ;) are NOT fake props and can be picked up and used. I know I really don't have to tell you this, but I'm gonna anyway! Before scrapping anything, Save your game! This settlement will require you to use "scrapall" and/or a scraping mod like Scrap Everything with the good old Place Everywhere. Because the only thing left will be the workshop workbench. 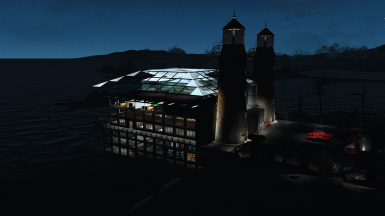 Yes the lighthouse has to go too. And the rocks, and the boat and the dock... everything. Now that it's all clean, import the blueprint. There is a Fusion Generator in the basement under the slot machines. The first pylon is a Power Everywhere pylon and will turn on all the lights. 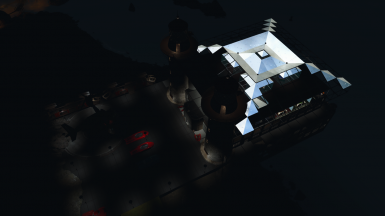 There is another Fusion Generator outside attached to the Recruitment Beacon which will power the beacon and street lights. 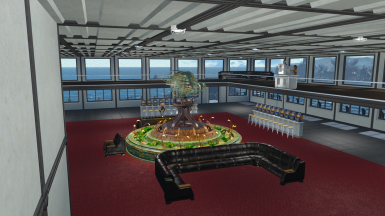 Powering the Slots/Soda Fountains can be done a couple ways. on each Soda Fountain and the Juice Me Up Station, then running a wire to the slots. Copy the .json file in the "1" folder to..